"Mild onion, kiwi, banana and orange are spiced with a chopped pepper in this refreshing summer salsa. Try it with chips, or as a side to grilled meats and fish." Heat 1/2 balsamic vinegar in a medium saucepan over medium high heat. Slowly cook and stir onion until soft. Stir in banana. Use remaining balsamic vinegar as needed to keep the mixture moist. 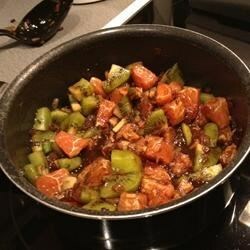 Stir in oranges, kiwis and serrano pepper. Cook and stir until all ingredients are soft. This was pretty unusual. I served it as a dip, but I think it would be better as a topping for grilled pork or fish. Loved it!I love Australia and because it is goning to be Australia Day tomorrow I decied to make it to test it out for my party and ate it with chips. Tasted awesome!